Last year (2015), twenty-three (23) members of the three Rotary clubs (website) (East Jefferson County, Port Townsend (Noon) and Port Townsend Sunrise Club) joined together with ShelterBox and the Marrowstone Island Emergency Preparedness Team (website) to support the 3rd Annual All County Picnic (link) in “CELEBRATING EMERGENCY PREPAREDNESS AND COMMUNITY RESILIENCE”. "Emergency Management is committed to support self-sufficient neighborhoods that are prepared for the challenges of a major emergency, to continue active partnership in the development of a culture of community resilience, and aid in creation of local emergency plans and procedures that will help neighborhoods cope." Come join us again on August 21, 2016. 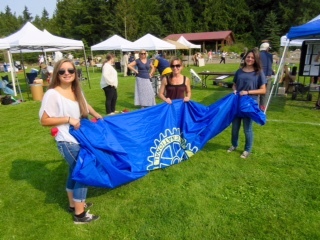 The All County Picnic was held on Sunday, August 23, 2015 from 11 AM - 4 PM at HJ Carroll Park in Chimacum, WA. 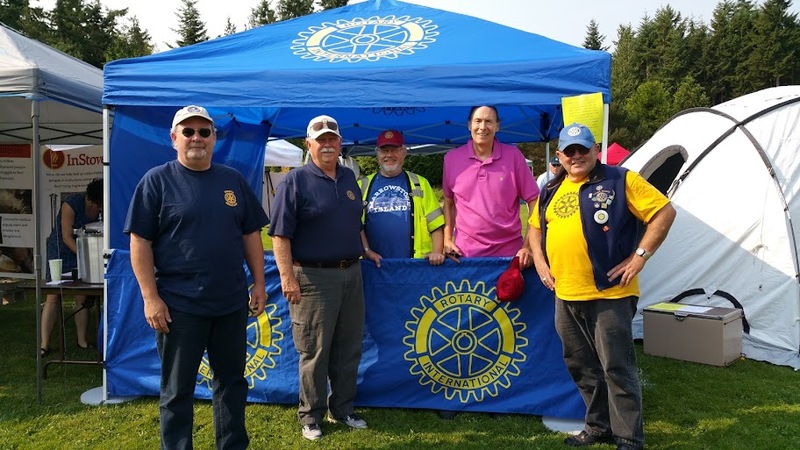 Rotarians arrived at 9:30 to set up the three tents. This was the best ACP of the three years. The lead producer - Danny Milholland reports "Final head count was 962, 35 new neighborhood organizers signed up, Speakers tent was a hit: 25-35 for the first two talks from 11:15 -12:15, upwards of 100 for the 2nd one at 12:30 and all the corn was served .... The final ears going out at about 3:45PM. Perfect amount!!!" ﻿Click here to read an article in the Peninsula Daily News. Click here to read Ned Luce's mention in "life in ludlow" in the PT Leader. Interact member Amy Plastow, her mother and Interact Sponsor TJ Plastow and our exchange student from Chile Cata Lima helping to setup the ShelterBox. In this picture, the ShelterBox tent appears in front of the MIEP tent (right side) and the Rotary tent (not seen). Click here to see the album of 20 photos. In this picture, the ShelterBox tent appears in front of the Rotary tent (left side) and the MIEP tent is not visible. This picture shows straight on shot of the MIEP tent. This picture shows straight on shot of the Rotary tent. L-R: Fred Obee, Ned Luce, Pete Hubbard, Hilary Smith, Jeffrey Hartman. This picture shows some of the insides of the Rotary and MIEP tents. L-R: Hilary Smith, Ned Luce,Fred Obee, Jeffrey Hartman.